Africa's best kept food secret has been US FDA GRAS (generally recognized as safe) approved and since then Baobab has recently reached countries like the US, Canada and UK and become an instant favorite for health conscious food lovers; however, this delicious tangy fruit with a citrusy grapefruit and caramel pear flavor is nothing new and has remained a main source of nutrition in Africa for centuries and used for its medicinal qualities. 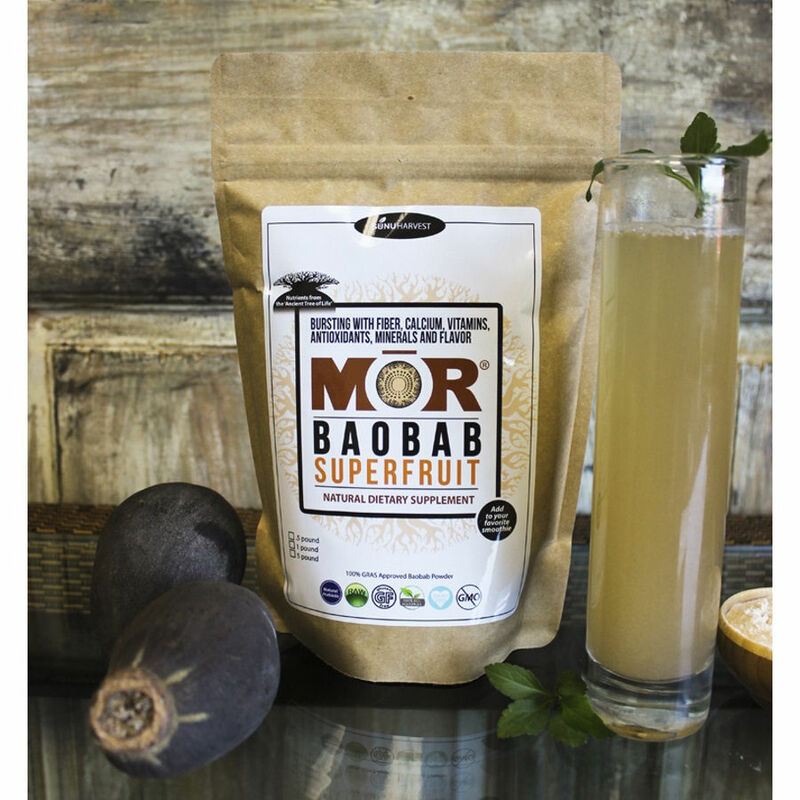 The baobab super fruit powers are more than just what its nutritional values reveal on its analysis. Its fair trade makes a positive balance in helping impoverished African communities and the global fight against nutrition deficiency. Numerous world health organizations, universities, health and scientific publications support this super fruit has being ideal to reduce world malnourishment. Baobab is the natural immune system booster. In addition to its potent micronutrient profile, Baobab has been confirmed to act as a natural super pre-biotic. Studies have also revealed that its polyphenols content have the ability to protect the body from free radical damage and support skin health. Since 2009, the FDA has approved the use of baobab in foods and drinks, and the dried fruit powder (which is actually the natural state of the fruit pulp) becomes the "Blender's Best Friend" being perfect to add to your smoothies and juices. 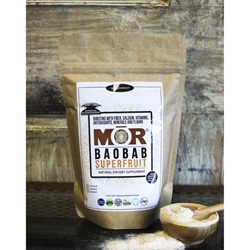 Baobab powder has also quickly been adopted as a praised ingredient in the natural food industry for nutrition bars, baked goods and countless other food applications. Baobab powder has high soluble fiber content and is also considered to be a great rehydration agent due to its high electrolyte profile, namely Potassium, Calcium and Magnesium. In addition these electrolytes and iron are all important alkalizing minerals to promote correct body pH acidity level. Baobab powder is also a natural multivitamin providing the body with vitamin A, B and C that contributes to endurance and energy. Baobab fruit powder is also loved and valued by food formulation experts and culinary chefs to use as a natural thickening and binding agent certainly due to its high pectin content of 25% which provide nice texture to most dishes. The Baobab fruit comes well protected in a coconut like shell and when opened you"ll find inside a naturally dehydrated large seeds coated with white powder side by side with brown colored fibers inside. The fruit pulp is then separated from the seeds and fibers and sieved into a powder, and that's it! No other processing is involved. As such, nutrients are not lost and the powder remains unprocessed in its natural form, as if you picked it yourself, making it a perfect raw super fruit! Our Baobab is directly sourced in partnership with the rural community women group in beautiful Djilakh located in one of Senegal's Baobab protected forest reserve through a sustainable and ethical trade. Baobab is Senegal's national emblem and the local population of the ""Tree of Life"" have been reported to be there for several centuries growing naturally in high calcium and selenium soil. 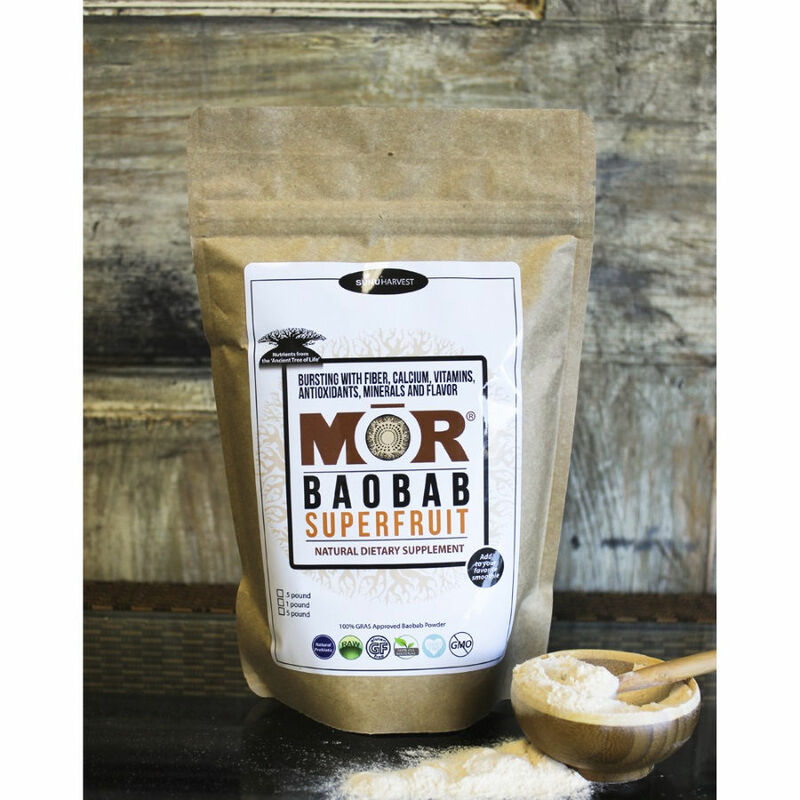 The MoR® brand organic Baobab powder is hand harvested and simply sieved to de-pulp the powder from the seeds nothing more is done to it. Strong quality control is maintained throughout all of the process from harvesting the fruits to packaging the powder done in our organic certified, cGMP facility in Western North Carolina. We care for the people who help us harvest the Baobab fruits and the people who consume the Baobab powder, us being the only bridge in between. No pesticides or foreign material are ever used! Help us be more creative, but we also recommend some of our favorites: healthy desserts, cream brûlée, bliss balls, raw cheesecake, snack bars, soups, jams, ice-cream & sorbets, sauces & salad dressings.